My Special Car Show 2008, the most important event within the Italian national car customisation sector took place at the Rimini fair grounds from March 28th through 30th, and Elettromedia’s participation ended with extraordinary success. Elettromedia’s booth displayed an array of four demo-cars equipped with the latest products from Hertz and Audison: for the most demanding audiophile, a Chrysler Grand Voyager featuring a system with Hertz Mille speakers, Audison Thesis HV venti and Audison LRx amplifiers; right beside it, a black Fiat 500 with an authentic entry-level installation with high-end sound, where the new Hertz Energy and Energy-Power product ranges were demonstrated; after an incredible tour through the most important European events, the long awaited comeback of the Fiat Grande Punto was featured in an area dedicated to the Masters Network. But the Abarth style Fiat 500 with a system engineered and fabricated by MMLab was the one with the most acoustic and visual impact. With its exceptional audio system featuring Hertz Mille subwoofers and Hi-Power amplifiers, it was its external set up, outfitted for a roof-top dance show that left visitors speechless. For the Masters Network, My Special Car Show 2008 represented a very special event: besides the gathering for the Masters Party at the exclusive Pascià disco in Riccione, the owners of the Masters Centres had the opportunity to be the first nationally to preview the new range of Thesis products. 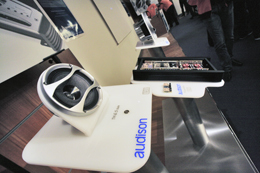 In a private meeting room, the new Audison Thesis speakers and amplifiers were revealed to just over one hundred people and presented by the same engineers who brought this project to life. After Rimini’s tremendous success, the next important event is with visitors at the Car+Sound in Sinsheim, Germany, April 10th through 13th.